Thoughts from the team's head coach. BYU’s Jason McKeen at the 2016 Northwest Challenge. 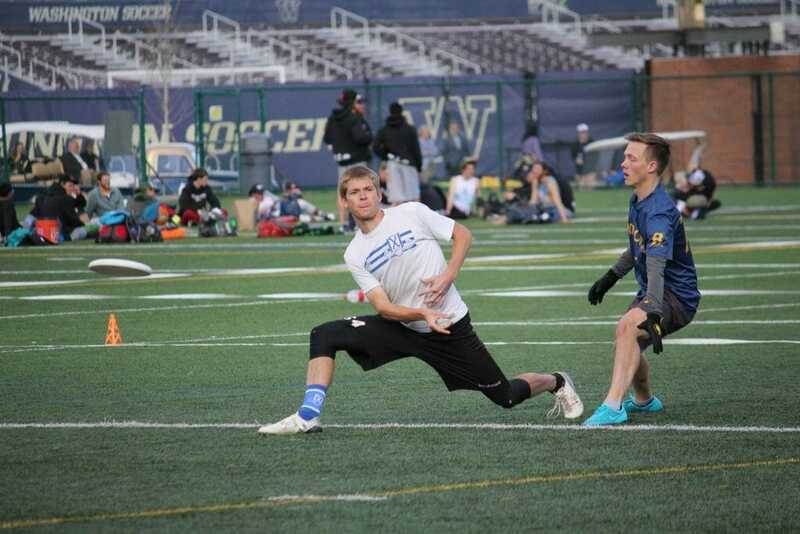 Photo: BYU Ultimate’s Facebook page. This article was written by BYU Men’s ultimate coach Bryce Merrill. In the spring of 2016, USA Ultimate Communications Director Andy Lee wrote, in determining bid allocation precedence, that the BYU and Union situation was ‘subtle and nuanced.’ It’s a phrase that has stuck with me over the last year. Communities and tribes and tents can be tough—especially when we’re actively working towards a lot of different goals at the same time. Whether its addressing gender equity or debating the role of referees and self-officiation, improving coaching resources or the determining the acceptable quality of tournaments and events, there’s always a passionate and informed community ready to weigh in and go to work. Consistently, the toughest issues that have the best outcomes involve a lot of communication, and a medium of communication that allows for ‘subtle and nuanced’ discussion. In my seven years coaching at BYU, I’ve sometimes been a part of the solution and other times a part of the problem. I’ve been flat out obtuse in approaching some conversations. But being a part of the ultimate community, I’ve had the opportunity to learn and grow. You can imagine—a white, Mormon, middle class, BYU graduate male living in Provo, Utah had (has!) a thing or two to learn about intersectionality and pluralism and, most importantly, equity. This community, and the lessons I’ve learned, have undoubtedly helped me develop a more compassionate and empathetic approach as a basic human being. As a team, a big part of our desire to one day attend the College Championships is recognizing the both the explicit benefits but also the cultural or implicit importance placed on the event by our community. As such, I will continue to be an advocate for BYU to have the opportunity to one day play on that stage. As part of that goal, I will work to ensure that it is not normalized that BYU is absent from the postseason. Teams should not be comfortably assuming our exit from the biggest and most important part of the season. This is not selfish. This is self-preservation. I will not apologize for that, but I hope to do so in a way that doesn’t compromise my personal commitment to subtle and nuanced conversation. As the community continues to engage in this topic, I’d challenge you to avoid obtuseness. Freud’s Narcissism of Small Differences notes that we often save our sharpest vitriol for those “communities with adjoining territories, and related to each other in other ways as well, who are engaged in constant feuds and ridiculing each other” due to a “hypersensitivity to details of differentiation.” We’re most likely to dig in our heels and resist ‘outgroups’ within our own communities. And when we as a community reward mic-drop comments in lieu of conversation, we normalize the extremes of each issue instead of the productive middle ground. In BYU’s travels across the country this year, I met hundreds of players and coaches and USAU staff that were kind and professional and everything I’d want from a community. Four tournament directors made accommodations to their tournament format that allowed us to participate in a portion of their event. We definitely felt welcomed. But there were other events that highlighted our status as an outgroup. This isn’t your normal online anonymous troll–this was behavior, in front of coaches and captains and fans, from national caliber teams and players–that they felt was permissible because we were BYU. After the high-five line following a close win against a national-caliber team this season, players from another university cheered, “Good luck on Sunday!” from their team circle and giggled to themselves, so pleased with their joke. How can I respect a coach or team that allows, or at worst promotes, that type of sportsmanship? Players from another university, after we broke for half and chanted our customary ‘Break! Break! Break!’ cheer, shouted “F— Jesus! F— Jesus! F— Jesus!” in time with our cheer, mimicking our hand movements. They didn’t know what their point was, but they knew that Jesus is important to us and by saying ‘F—’ in front of His name, it somehow would assert their superiority. Or consider #21 from another university we played a couple weeks ago who, in the middle of a contested in/out discussion, fired back with “Well at least I play on Sunday!” I mean, that doesn’t even make sense. He had no point. But he knew he was right, because we were BYU and he played on Sunday and that meant he was better, or, in this case, that he was in bounds. These are obtuse teams and obtuse individuals making obtuse choices. But these choices add to the fabric of the BYU season and experience. They’re also part of the ultimate community, where we revere irreverence and humor and counter culture. I get that. Humor plays an important role in defining the boundaries of a society and helping refine the expectations of appropriate behavior. But these individuals, and others, missed the boat on subtlety and nuance. Ask: “Would I say this comment about another ‘outgroup’ within the ultimate community?” Would I use this same line of logic in talking about accommodations for other ‘outgroups’? What if USA Ultimate, in lieu of leaving our bid in the Northwest, just qualified 19 teams for Nationals? Everyone who earned a bid still gets a bid. No one who didn’t earn a bid gets one. Parity at nationals achieved! They all had a chance to play in multiple tournaments this spring and so did we. Now we’ll leave the bids to the qualified and able teams. Are you still outraged? If so, why? Is the gender equity movement being ‘selfish’ and ‘disrespectful’ when they demand more filmed games for women’s teams? Think of all the mediocre men’s teams that no longer have access to coverage! The outrage! Did BYU really get a ‘seat at the table’ to discuss this issue with USAU? Maybe. But I’d have no idea, because we were left as uninformed bystanders while decisions were made behind closed doors. That should upset you. Or not. But if not—were you upset by the communication surrounding the Buzz Bullets situation? If so, why? There might be differences, but they’re subtle. I’ve got work to do too. Sometimes I let the tone of a GroupMe chat leak into the public conversation. I should’ve known the consequences before enrolling at BYU? Well you should’ve known the consequences of enrolling at a school with a mediocre sports team! Oh yeah, got ’em! You played yourself! I joke, sort of, but that’s literally what I said about six months ago. My bad. My echo chamber loved it. We all giggled and high fived. But we didn’t move the conversation any closer to middle ground. I’ve got to be better, especially in these crucial conversations. Telling teams to just win more games isn’t beneficial. But also, it’s the playoffs and teams eventually need to win or go home. Where’s the common ground in that conversation? Is there a productive space to discuss something there? What about the additional costs to teams? Telling teams to pony up for the privilege to play is obtuse. But claiming that hundreds of teams will have to spend thousands of dollars isn’t true, either. It’s a handful of teams from the Northwest—and if it’s a finite number of teams with a finite cost of additional travel, is there a dollar amount that would bridge that gap? If so, what is it? Is there an accommodation that could be made? I hope that both USA Ultimate and the ultimate community will allow for this subtle and nuanced conversation. I hope I have the maturity to as well. Let’s work to have a better conversation. Comments on "Let’s Have A Better Conversation About BYU"